I tend to get a sore neck not simply from looking up at wires all the time, but from adjusting my position underneath until I have what I think is the best angle to view the chosen scene of birds and wires. The dog is very patient through all of this, and so are passing pedestrians who for some reason tend to join me, however briefly, in looking up. This painting continues around the sides, which are 0.75″ wide. If you are known to me you could always pay me direct and save me the processing fees. I’d like that. 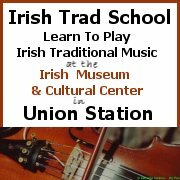 If you are in or near Dublin you could save the shipping expenses by meeting up with me in town or at my studio in Lucan. Wires, Birds #5 is part of the End of Year 2009 online sale of paintings, which has launched with paintings at half-price and FREE shipping worldwide until Christmas Eve. Dozens of new paintings are being rolled out on my personal blog Bicyclistic in batches of 5, 6 and 2, 3. To see announcements first follow me on twitter. 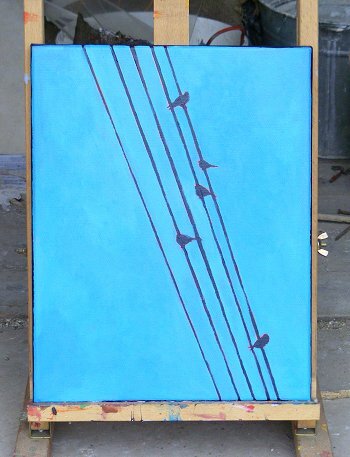 The blue in this painting is a little bit darker than represented here I’d say, and like in the other birds and wires paintings there are glimpses of red around parts of the edges of the birds which aren’t coming out so well, if at all, on the photo.